Good judgement is the result of experience, experience is the result of bad judgment. "We live in an age when machines can learn. Can government?" concludes a great paper by Businessweek. The saga of healthcare.gov has been a symphony of government inefficiency. The effort, directly overseen by the IT department of the Centers for Medicare and Medicaid Services, involved no fewer than 55 contractors. The process was thick with lawyers and political interference. In violation of current best practices in the software world, the code was kept almost entirely secret; other engineers weren’t able to point out its flaws, and it wasn’t tested rigorously enough. The Obama administration has been assailed for not calling in Silicon Valley’s top minds to collaborate, but that misses the fundamental problem: The best coders in the Valley would’ve never agreed to work under such deadening, unpleasant conditions. For all its deficiencies, healthcare.gov isn’t the worst disaster a government has experienced on a major IT project. That distinction belongs to the U.K.’s endeavor to create an electronic medical records system for its National Health Service. The effort, which began in 2002, tore through about $10 billion before the government admitted it simply couldn’t be salvaged. In an editorial at the time, the liberal Guardian newspaper declared, "The government is an inept purchaser of private services: indecisive, ponderous, overambitious, and wasteful. Mass centralisation does not reduce costs, but it kills flexibility." The British learned from their mistakes. The disaster empowered Francis Maude, the minister for the cabinet office, to bring in technologist Mike Bracken to overhaul how the British government did IT. Today, gov.uk is something of a wonder. It’s a single, centralized portal to pretty much everything the British government might be able to do for you. It’s designed for users. It’s nominated for awards. With the deep admiration of Silicon Valley boosters, Bracken is working to change everything about the way the British government builds technology. His keynote speech at the October Code for America conference received a standing ovation. "This is a hard problem for government," Bracken says, "because it’s not really a technology problem. It’s a self-image problem. Government constructs its self-image in terms of size. It thinks of itself as huge and big. I’ve been in D.C. and seen your buildings. They’re very big! The harsh truth for governments all over the world is that many digital public services could be developed at a fraction of the size of nondigital services, and they can be created by very small teams of people in an open way." Never build a website that’s too big to fail; instead, start small. Do open-source when possible, preferably always. Have in-house strategy, design, and tech. 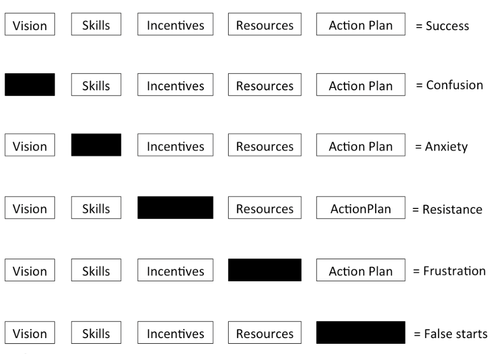 Five key elements are required to achieve change: vision, skills, incentives, resources, and an action plan. The vision, central to the direction and goal-setting, provides the launch pad for action and the parameters for problem solving. Skills must be built to realize the vision. Incentives help to motivate the workforce to acquire and maintain new skills, to aid adoption, momentum and motivation. Adequate resources allow the vision to be achieved. The action plan runs as a consistent guiding foundation throughout the process of change. Inspired by a blog post by @neilperkin and a document by excellencegateway.org.uk. Reference for the framework is Knoster, T., Villa, R., & Thousand, J. (2000). A framework for thinking about systems change. In R. Villa & J. Thousand (Eds. ), Restructuring for caring and effective education: Piecing the puzzle together (pp. 93-128). Baltimore: Paul H. Brookes Publishing Co.
You may think that, after all, it is (rather) well known that people usually imagine normal (or Gaussian) distributions because such distributions are “sort of” natural. No surprise that they imagine both the ideal wealth distribution and the distribution they think is actual as something like a Gaussian curve. We also know that the distribution laws used to describe the allocation of wealth among individuals, among which the famous Pareto distribution, are Power Laws, not Normal Laws. Normal laws are models of ordered hazard while power laws describe a “wild hazard”… and it seems that wealth distribution never belonged to the category people estimate. Ok, let’s assume that wealth distribution belongs to the “wild hazard” category. Maybe this can be explained by the fact that our economies need investments and that innovation will only create jobs if somebody can put his own cash at risk. Accordingly, super-richs would be needed so that others can get a job. Our hypothesis here would be that a wild distribution of wealth could be correlated to some economical sanity. In a blog post by the title "The Great Decoupling of the US Economy", Andrew McAfee states that "the things that workers care about – jobs and wages – become decoupled from the the other things that economy-watchers care about". 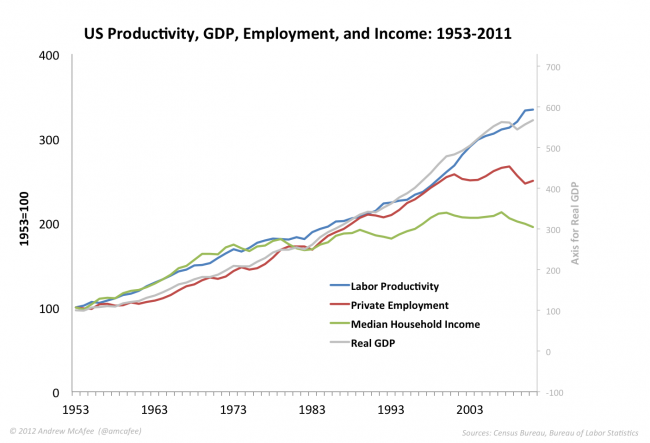 As demonstrated by a graph showing that GDP and Labour Productivity recently became uncorrelated from Employment and Median Household Income. This chart is a sign that something new is at stake, and that the "economic sanity hypothesis" may have been valid but is probably no longer so. In this video, Clayton Christensen provides an insightful explanation of what probably caused the decoupling: the virtuous innovation cycle that drove the development of our industrial society has been interrupted because financial institution discovered that they can maximize profits using a short loop. As Clayton Christensen describes it, it looks like a curse. But it also may be the sign that the industrial age paradigm, in which money fueled innovation, must be replaced by something new. Of course, we can think of Jeremy Rifkin’s Third Industrial Revolution, but Rifkin’s starting hypothesis is that industrial revolutions always ignite with the shift to a new energy regime. Hence, the first of his "Five Pillars" reads shifting to renewable energy. In my opinion, the Third Industrial Revolution must first be an information revolution before any energy regime revolution can occur. I strongly agree with Simon Phipps, who recently lead track called "Meshed Society and Freedom to Innovate" during last Open World Forum in Paris that the freedom to innovate in the modern, meshed society is being threatened by the legacy tools that regulated the control-point society inherited from industrial ages. Freedom to innovate should now be the major priority. Allowing our meshed society to break current innovation short loop (by example to shift to a grid of renewable energy à la Rifkin) fully relies on breaking well established control points. I was upset that the conclusion of Open World Forum’s track was mainly about asking governments or regions to pass new laws. In my opinion, the current political organization is inherited form the "horses ages" (when people had to elect a literate among them to represent others in a capital that was many days away by horse). In current electron age, where a meshed society can be born from the wisdom of crowds, the tenants of traditional (highly indirect) democracies hardly belong to the solution frame and are probably deeply rooted in the problem frame. Regions, governments or national assemblies may be the proper vector to help disseminate Libre Office but certainly not to allow a meshed society organize their obsolescence! In her paper titled "Leverage Points Places to Intervene in a System", Donella Meadows orders places to intervene in a system. She states that the rules of the system is in 4th place, while the distribution of power over the rules of the system is in 3rd place, behind the goals of the system (2nd) and, first and most efficient "leverage point", the mindset or paradigm out of which the system arises. As a conclusion, and using Donella Meadows’ leverage points in the proper order, I would say that it is now time to grow among our fellow world citizen the awareness that we can, and even should, adopt a new mindset. Cycling from the start of this post, I would also consider the second leverage point and question whether the goals of any system should be limited to make riches richer! Ces bateaux sont magnifiques, mais il suffit d’une risée traitresse pour faire chavirer deux marins particulièrement expérimentés. You really tought I meant it? Did you? You are currently browsing the Blog Odyssée weblog archives for October, 2013.